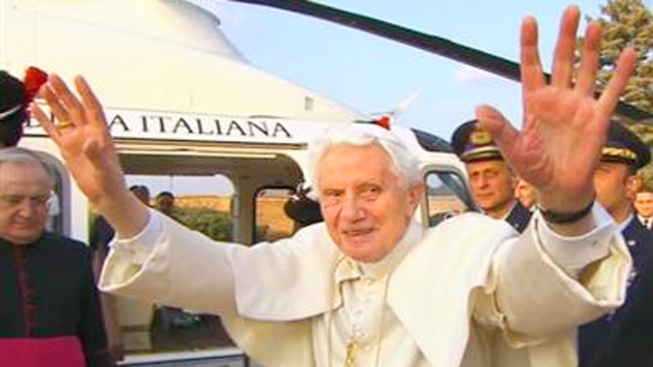 Pope Benedict waves before boarding his helicopter to Castel Gandolfo, his summer papal residence. Benedict XVI stunned the world when he announced Feb. 11 he would resign as pope. But in retrospect, all the signs were there, and they even accelerated in recent months. Here's a look at the hints Benedict dropped starting in 2005, his first year as pope, indicating that unlike his predecessors over 600 years, his papacy would end in retirement, not death. —In his first encyclical "God is Love" — published eight months after he was elected — Benedict wrote about service. "It is God who governs the world, not we. We offer him our service only to the extent that we can, and for as long as he grants us the strength." —Five years later, in the 2010 book "Light of the World," Benedict made it more explicit, and personal. "If a pope clearly realizes that he is no longer physically, psychologically and spiritually capable of handling the duties of his office, then he has a right, and under some circumstances, also an obligation to resign." —In March, according to the Vatican newspaper, he decided to resign after an exhausting trip to Mexico and Cuba. He told only a handful of people and the only visible sign for those in the know would come seven months later when renovations began on the monastery in the Vatican gardens where he will live. —In June, the Vatican appointed Fox News correspondent Greg Burke as a senior media adviser in the secretariat of state, perhaps anticipating the crush of media interest in all things Vatican. Burke has become a much sought-after television commentator in recent weeks. —In November, Benedict created six new cardinals — not a single one from Italy or Europe — making a very international final mark on the club that would elect his successor. —In December, he received the final report of the commission of cardinals investigating the leaks of his personal papers and he pardoned the butler who stole them, closing a chapter on an embarrassing and damaging scandal so that his successor wouldn't have to deal with it. He has, however, left it for the new pope to decide what to do with the report. —In December, he named his closest aide Monsignor Georg Gaenswein to be head of the papal household and promoted him to an archbishop, thus assuring his future career after Benedict was no longer pope. —In January, he consolidated the Vatican's media accreditation operations, perhaps in anticipation of the throngs of journalists converging on Rome for the conclave. —Also in January, he named a new director of the Vatican's television operations, which are being heavily taxed by the demands of the resignation and conclave. The appointment relieved the Vatican spokesman, the Rev. Federico Lombardi, of one of his three main jobs and enabled him to focus exclusively on his role as spokesman and head of Vatican Radio. —And in late January or early February, he reportedly halted the presses of the Annuario Pontificio, the Vatican's annual yearbook, which normally is printed in early February for publication in March. The book, which in 2012 ran some 2,435 pages, is now not due out until May, La Stampa newspaper reported.